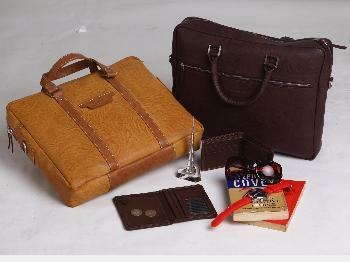 TRAFELWOODS is committed to creating finest quality leather and PU leather bags and other goods. INTERNATIONAL STANDARDS QUALITY & EXQUISITE DESIGNS Our products are made with finest quality PU leather and components - zips, fittings and lining & marine grade threads to meet international standards. We use only high grade PU leather sheet free from harmful heavy metals and carcinogenic chemicals. Product report available on request. USABILITY Our products are Durable, Water Resistant and Padded to securely carry laptop & contain in-built organizers , multiple pockets and partitions for extensive space to carry pens, files, notebooks and other items in an organised manner. Warranty valid for 1 year from date of purchase. Although we undertake stringent quality checks, in the event of inadvertent wear and tear we will be happy to repair the products even after warranty period is over. TRAFELWOODS is  committed to making high quality leather & PU leather bags. Made with finest quality PU leather and components - zips, fittings and lining & marine grade threads to meet international standards. High grade PU leather sheet free from harmful heavy metals and carcinogenic chemicals. Product report available on request. Our products are Durable, Water Resistant and Padded to securely carry laptop & contain in-built organizers , multiple pockets and partitions for extensive space to carry pens, files, notebooks and other items in an organised manner.